The history of Lake County California certainly is fascinating and varied. From ancient Clear Lake and Mt. Konocti, to the Pomo Indians, turn-of-the-century hot springs resorts, and modern day agricultural production of winegrapes and pears, Lake County has a long history and wonderful heritage from the past for future generations to come. American Airways Boeing 314 Clipper sitting on Clear Lake. Circa 1941. Geologists believe that Clear Lake may be the oldest lake in North America, with lakes existing at its site for approximately 2.5 million years. Clear Lake was born when a huge landslide dammed the headwaters of Cold Creek, blocking westward water flow into the Russian River. Water filled the level valley. The rising waters eventually found an outlet in Cache Creek, which drained eastward into the Sacramento River. Mount Konocti, the largest volcano of the Clear Lake Volcanic Field at 4,299 feet, rises above Clear Lake. The volcanic field, part of the Pacific Ocean’s Ring of Fire, contains seven volcanic vents from 10,000 to 2.5 million years old. The Xa-Ben-Na-Po Band of Pomo Indians inhabited the region as many as 12,000 years ago – 4,000 years before Egyptian civilization. Mount Konocti was revered as sacred by the peaceful tribes, who numbered in the thousands until the early 1800s. A proliferation of fish, game, waterfowl, and plants provided an abundant life for the Pomos. Some wildlife was off limits for hunting, including the bald eagle, called “Great Chief” and “Very Dangerous Bird,” and the golden eagle, both of which continue to nest in the region today. The Pomos found many uses for tule grass, including constructing intricate baskets for cooking and fishing, as well as boats for fishing. Tule grass also was used to make shelters, sleeping and sitting mats, clothing and dance regalia, and diaper filling. Shell beads, collected on yearly treks to the Pacific coast, were part of a complex currency system. Middletown Rancheria of Pomo Indians of California. Circa 1910. A handful of Wappo and Miwok also lived near the lake. The Indians coexisted peacefully, granting each other access to water and land simply with respectful requests. Violence was not used to resolve disputes except as a very last resort. Beginning in 1821, enslavement and mistreatment by Spanish soldiers and missionaries, Mexican land barons, European settlers, and gold diggers, combined with a lack of natural immunity to European diseases, nearly decimated the Pomos. By 1900, only 450 Pomos survived, compared to an estimated 1850 population of 3,000 in 30 villages. Today, six Pomo tribes reside in Lake County, and three bands operate casinos. By the mid 1850s, American pioneers and European families were making their homes in Lake County, planting orchards and tending cattle ranches and farms. Mines yielded quicksilver, gold, and borax. Privately owned toll roads were dug into the mountains, bringing more people, who built stores, banks, churches, saloons, and other businesses, forming dozens of communities in the hills and around Clear Lake. By 1856, two public school districts existed in Clear Lake Township. The act for combining portions of Napa, Mendocino, and Colusa counties to form Lake County was approved by the California Governor on May 20, 1861, with Lakeport as the County Seat. The first courthouse, a wooden structure built in 1861, burned in 1867. It was replaced by a brick courthouse covered in concrete, which was completed in 1871 and was the first California courthouse listed in the National Register of Historic Buildings. It is now home to the Lake County Historic Courthouse Museum. 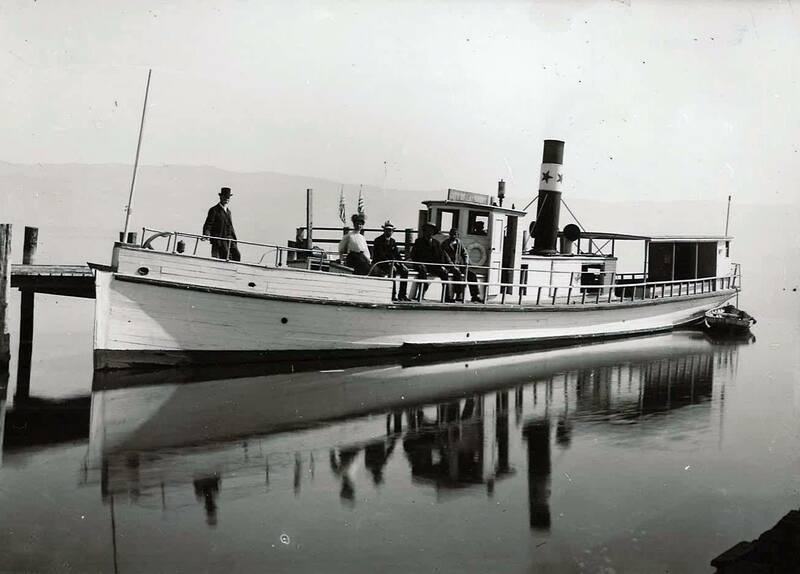 The City of Lakeport was a miniature steamboat brought to Clear Lake in 1875. In 1874, steamers began ferrying locals and tourists from town to town around the lake. Hotels and retreats were built at a feverish pace throughout the region, prospering even though the Clear Lake Railroad never made it to Lake County as planned. By the 1880s, the hills were dotted with luxurious resorts built around mineral springs. Wealthy visitors from San Francisco and other parts of the world frequented the resorts, traveling to “take the waters” and indulge in lavish parties at establishments such as Hoberg’s Resort. It is believed that the 1906 earthquake caused many of the hot springs to stop, slow down, or go underground because most springs changed around that time and in the years that followed, fires destroyed most of the resorts that remained. Lake County has a long wine history that dates back to the 1850s when early settlers first began planting vineyards, which flourished in Lake County’s Mediterranean microclimates and soil rich in volcanic ash. In the 1870s, acres of vines were planted by visionaries such as Serranus C. Hastings, the founder of Hastings Law School. In 1888, acclaimed British actress Lillie Langtry purchased 4,190 acres in Guenoc Valley near Middletown, which included vineyards that had been planted in 1854. She brought her own winemaker, establishing the Guenoc & Langtry Estate Winery – today known as Langtry Estate & Vineyards – with their first vintage in 1891. In 1906, however, despite long-term plans to live side-by-side with her lover Fred Gebhard and raise grapes and horses, Lillie returned to Europe. In 1893, a young Harvard graduate, Charles M. Hammond, won best exhibit for dry white and red wines at the World Exposition in Chicago with wine produced at his Lake County vineyard, earning Lake County a solid reputation for producing some of the world’s greatest wines. By 1909, Lake County had nearly 600 acres of vineyards. The decline of tourism that followed the 1906 San Francisco earthquake, and Prohibition between 1920 and 1933, combined to bring an end to what had become an internationally recognized wine industry. Hardy ranchers replaced grapevines with walnut, pear, and other fruit trees; many abandoned their land. By 1960, only 100 acres were dedicated to vineyards. Nearly a century after the first Lake County vineyards were planted, in the 1960s, a few visionary farmers rediscovered Lake County’s prime growing conditions for winegrapes. After the Napa Valley wine industry made a comeback, Lake County farmers began planting vineyards once again. By 1990, there were 2,700 acres of grapes in the county; more than 8,500 acres are planted today. Today, Lake County calls itself “The Undiscovered Wine Country,” encouraging visitors to come and explore its high-elevation vineyards and vast and varied territory. Less well-known than its neighboring Wine Country growing regions, Lake County is an ultra-premium winegrape growing region with a growing reputation for producing truly excellent wines. For more information about winegrape growing and wineries in Lake County today, visit the “Wines & Vines” section of this website. The first Fowler Steam Tractor in Lake County. Circa 1891. The very first pears were planted here in the 1880s. Great-grandfather of Myron Holdenried (founder of Wildhurst Vineyards), Louis Henderson planted pears in 1890 and those orchards are still in production today, farmed by Myron’s cousin Diane Henderson. Thomas Porteus is credited for planting the first commercial orchard in Lake County in the late 1800s, four acres in Big Valley. L.P. Clendenin in Scotts Valley, J.B. Laughlin and George Akers of Kelseyville, and J.W. Annette of Finley followed his lead, and by 1919, there were 700 acres of pears in the county. In the early 1920s, the California Packing Company was established and operated the largest dry yard in the world in Kelseyville, which today is the site of Adobe Creek Packing Company. Early fruit was dried until after World War I and primarily shipped to Europe where food was desperately needed. In the mid-1920s, Europe was requiring a tariff be put on imported foods just as boxing fresh fruit became the norm. While most boxed fruit was shipped or carried by train, Lake County had to haul pears by truck to the Hopland grade or Ukiah because the railroad system never made it to the area. Up through the 20th century, Kelseyville was revered as the “pear capital of the world.” In 1999 alone, 85,000 tons of pears were processed in Lake County – most in Kelseyville. The Lake County Pear Association was established in 2005 and works to promote the many varieties of Lake County pears. Today, Lake County celebrates its special pears and agricultural history and heritage each year with the Kelseyville Pear Festival – a daylong event that summons thousands. The Lady of the Lake label was formerly a label for Lake County pears and featured the “Lady of the Lake” holding a pear in her palm. In 2004, Mt. Konocti Growers took it upon themselves to update history by combining the area’s two best agricultural assets: pears and wine. Lady of the Lake Sparkling Pear Wine uses the nostalgic label, replacing the lady’s pear with a champagne glass. Why not explore our Heritage Tour page featuring an audio history of Lake County. Historic Lake County map from 1892.